Perfect Wailea Ekahi condominium, tastefully renovated! Ground floor center unit, #13B. Bamboo hardwood floors recently installed in the living area. New air conditioning in the living room and bedroom. Wireless Internet in the unit if you just have to stay connected! (What kind of vacation is that?) Ipod player, so bring your favorite music. Sleeps 4 in comfort (5 with a kid's blow-up bed). 2 full bathrooms. Center lower unit in building 13, so no stairs to deal with, and a short, level walk from the parking lot. Large lanai (with 2 chaise lounges, a loveseat, a new gas barbeque, table and 4 chairs) which opens directly onto a lawn. Quiet and secluded adult pool close by, with the Ekahi family pool, rentable pavilion, and Keawakapu beach just a few steps beyond. Ekahi is probably Wailea's best condominium development - conveniently located, beautifully kept, with excellent on-site management, and friendly (but very alert) security. It is less than 18 miles or 30 minutes from Kahului airport (OGG), which has many non-stop flights from the US & Canada. You'll find yourself driving slowly from the airport, just to soak in the feeling of being on the island! Lauren and I live in San Francisco and work full time there in residential real estate. We bought this unit from delightful, long-term, original resident owners. Lauren personally supervised a major remodel of it, adding exquisite furnishings and air conditioning! She updates it every 6 months, recently installing bamboo hardwood floors in the living area and new cabinet facings in the kitchen and bathrooms. I was delighted when I found out that Ekahi had been designed by the highly-respected San Francisco architectural firm of Esherick, Homsey, Dodge and Davis. As an architectural researcher, I wrote an article several years ago on their founder Joe Esherick. I'll e-mail that article to you upon request. Ekahi attracts many full-time residents as well as vacationers. It is a mature, peaceful, well-managed condominium complex in Wailea, with beautifully-maintained grounds. Facing west, you'll enjoy fabulous sunsets at all times of the year! Staying in our unit at Ekahi, you'll understand why the locals say 'Maui No Ka Oi' ('Maui is the Best'). 13B is a quiet center lower unit, so it has no stairs, the largest private lanai in Ekahi, and every room enjoys the ocean view! 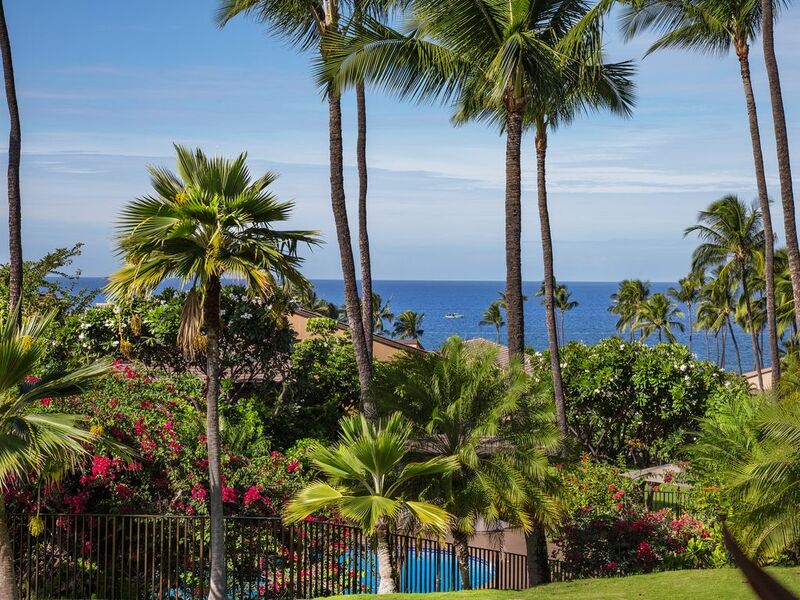 It is just steps to the nearest, quiet, adult-only pool and 300 yards or a 3 minute walk to lovely Keawakapu beach and the beachfront walking/jogging trail that leads to the Shops at Wailea and the major hotels. You'll just love it! Take advantage of the slower summer months to kick back and enjoy a long vacation here! toilet, shower, Privately accessible from the master bedroom. toilet, shower, Accessible from the hallway. Wailea is a fabulous planned development in southwest Maui. I've been to Maui 100's of times and wouldn't stay on any other part of the island. Easy walk across greenery to Keawakapu Beach. From all major rooms, even while laying flat in bed! Bathroom towels and beach towels. Comfortable living room with ocean view, TV, and large sofa-sleeper. Adult pool close by; larger family pool and recreation room near the beach. Air conditioning in living room and bedroom. New bamboo hardwood floors in living room and dining room. Ipod player and charger. Additional inflatable bed if needed. Boogie boards! As stated previously the place was absolutely beautiful with a well stocked kitchen and chairs and umbrellas for the beach . The garden and patio area were beautiful as well with a stunning view of the ocean. Many dinners were prepared on the grill and enjoyed, as well as breakfast! Simply lovely. Can’t wait to go back! Glad you enjoyed your stay! We also love the location and strive to make our unit perfect for our guests. Absolutely Perfect for Our Family! We stayed in 13B for a week in late August. It was perfect for our family of 4 (2 adults, 1 toddler and a teen). Beautifully appointed (even better than the photos), air-conditioned, big lanai, QUIET and ocean views. Comfortable and simply lovely. The 2 full bathrooms and washer/dryer was must for us. Grill works great and the kitchen is fully equipped. The condo has beach chairs, a cooler and even beach towels. The sheets and bath towels are luxury hotel quality. I spent HOURS reading reviews before settling on this unit- so glad I did! The Ekahi Village property is beautifully maintained and you can't beat the pool and beach location- we spent most of our time between the pool and the beach (turtles, fish, small waves) and only ventured out a bit because we were so happy with the location. I've stayed on the island numerous times in both condos and luxury hotels- this is now our go-to spot. One thing to note- the higher the building number, the further from the beach- this condo is a short walk to the pool/beach. It is uphill on the way back (short), but unless you have physical issues, its not a problem. David was wonderful- so easy to work with, we will be back! This property is close to ideal...it has the best lanai at Ekahi with a phenomenal view of the ocean and beautiful trees and flowers. It has very comfy loungers, side tables for drinks, a great BBQ, shade when you need it, and even a fan to keep you cool while you're sitting at the table eating dinner and watching the sunset. David and Lauren are great hosts (we've stayed with them twice now), and Lauren does a wonderful job decorating. The new mattress on the sofa bed is great, as are the aesthetic upgrades (though you'll be on the lanai when not sleeping as it's so great). Super location in Wailea -- short walk to beach and pool. Very upscale. Keawakapu is one of our top three beaches on Maui (great for long walks and bobbing in waves in the morning and boarding in the afternoon, plus easy access to the Wailea boardwalk)...and we're not alone: there are $25 million properties backing on to it. Thank you for the comments. We aim to please! This lovely condo has a beautiful location and all the amenities needed for a perfect stay. Beautiful views of the ocean can be seen from the spacious lanai. The Keawakapu Beach is a short walk from the property. We enjoyed morning walks along the beach trail. The Shops at Wailea are also a short distance from the property. Our stay was very comfortable and we will definitely stay here on our future trips to Maui. Wonderful views of Wailea Beach in Maui! Recently stayed 4 nights at the Condo. Perfect place to stay for a couple or family. The condo was wonderfully decorated and had every thing you could possibly need. King bed was extremely comfortable! View out the back Lanai is gorgeous you can see down the water. Much nature , very soothing to relax outback. Slight walk down the beach, which is perfect for enjoying the water and sun. Ton of turtles feeding just off the rocks there at the village club. And great snorkeling there right off the beach. We loved our stay and hope to come back again soon! Golfers: we are directly opposite the famous Wailea Old Blue course, with Wailea's Emerald and Gold courses just a little further south, and Makena's courses just south of those. No security deposit, resort fee, or parking fee. No cleaning fee if the minimum number of nights is met or a gap in the calendar is less than the minimum!